I can't believe that Finding Dory is almost here! I've been waiting years for the release, and it's SO close, you guys! Eeek! Our Finding Dory 'Just Keep Swimming' party was so fun to create! I loved watching the faces of my boys and the other party guests as they looked at all party decor, and fun party favors. You can catch the rest of our party over on the Shindigz blog - there I'm sharing all the fun little details and ways I personalized the party with everyone's favorite Dory quotes! 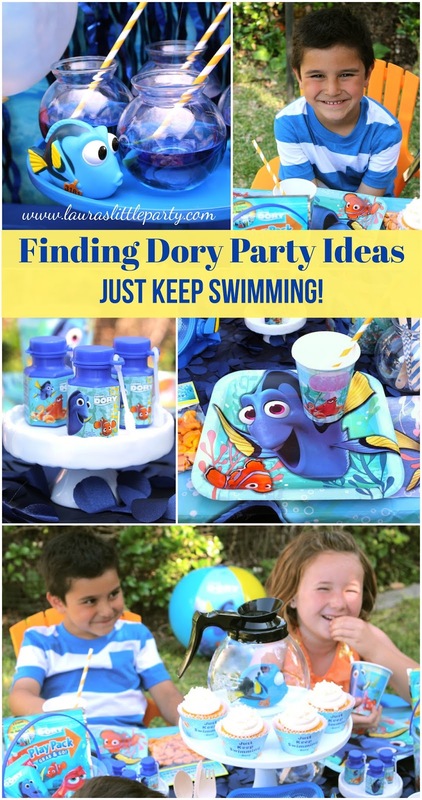 Just keep swimming, just keep swimming... Pin this later for some Finding Dory Party inspiration! This whole post makes me happy. I am still in love with Dory inside the coffee pot! You're the sweetest, Elise! Thank you! Have you seen the movie yet? ?